The heavily-armed Black Widow was this country's first aircraft specifically designed as a night-fighter. In the nose, it carried radar equipment which enabled its crew of two or three to locate enemy aircraft in total darkness and fly into proper position to attack. Delivery of production aircraft began in late 1943. 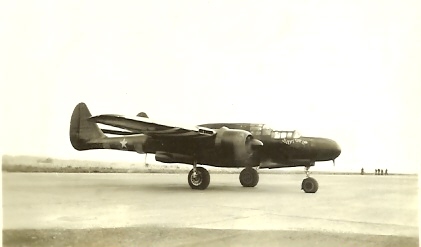 The P-61 flew its first operational mission as a night fighter in Europe on July 3, 1944, and later was also used as a night intruder over enemy territory. In the Pacific, a Black Widow claimed its first "kill" on the night of July 6, 1944. As P-61s became available, they replaced interim Douglas P-70s in all USAAF night fighter squadrons. During WWII, Northrop built approximately 700 P-61s. Information courtesy of the USAF Museum Archives. The photo was scanned from the personal album of Capt. Maurice Langford.